Previous studies have demonstrated that common breast cancer susceptibility alleles are differentially associated with breast cancer risk for BRCA1 and/or BRCA2 mutation carriers. It is currently unknown how these alleles are associated with different breast cancer subtypes in BRCA1 and BRCA2 mutation carriers defined by estrogen (ER) or progesterone receptor (PR) status of the tumour. We used genotype data on up to 11,421 BRCA1 and 7,080 BRCA2 carriers, of whom 4,310 had been affected with breast cancer and had information on either ER or PR status of the tumour, to assess the associations of 12 loci with breast cancer tumour characteristics. Associations were evaluated using a retrospective cohort approach. The results suggested stronger associations with ER-positive breast cancer than ER-negative for 11 loci in both BRCA1 and BRCA2 carriers. Among BRCA1 carriers, single nucleotide polymorphism (SNP) rs2981582 (FGFR2) exhibited the biggest difference based on ER status (per-allele hazard ratio (HR) for ER-positive = 1.35, 95% CI: 1.17 to 1.56 vs HR = 0.91, 95% CI: 0.85 to 0.98 for ER-negative, P-heterogeneity = 6.5 × 10-6). In contrast, SNP rs2046210 at 6q25.1 near ESR1 was primarily associated with ER-negative breast cancer risk for both BRCA1 and BRCA2 carriers. In BRCA2 carriers, SNPs in FGFR2, TOX3, LSP1, SLC4A7/NEK10, 5p12, 2q35, and 1p11.2 were significantly associated with ER-positive but not ER-negative disease. Similar results were observed when differentiating breast cancer cases by PR status. The associations of the 12 SNPs with risk for BRCA1 and BRCA2 carriers differ by ER-positive or ER-negative breast cancer status. The apparent differences in SNP associations between BRCA1 and BRCA2 carriers, and non-carriers, may be explicable by differences in the prevalence of tumour subtypes. As more risk modifying variants are identified, incorporating these associations into breast cancer subtype-specific risk models may improve clinical management for mutation carriers. Germline mutations in BRCA1 and BRCA2 confer high risks of breast, ovarian and other cancers [1–3] and account for 15 to 20% of the excess familial risk of breast cancer among first degree relatives [4, 5]. Breast cancer risks for BRCA1 and BRCA2 mutation carriers have been estimated to range between 40 and 87% by age 70 [6–12] with population-based estimates tending to be lower than estimates based on families with multiple affected individuals [6, 8]. Moreover, breast cancer risks for mutation carriers were found to vary according to the age at diagnosis and the type of cancer of the index patient involved in the family ascertainment [6, 7, 11]. Such evidence suggests that genetic or other risk factors that cluster in families modify the cancer risks conferred by BRCA1 and BRCA2 mutations. A substantial body of work indicates that tumours arising in patients with germline BRCA1 mutations are morphologically and genetically distinct from those arising in carriers of BRCA2 mutations and from tumours in patients lacking mutations. In gene expression studies, BRCA1-associated tumours are often classified as basal subtype tumours [13, 14]. This is reflected in their higher grade, and morphologic features including lymphocytic infiltrate, pushing margins and syncytial growth. Being basal-like they express several markers that are normally expressed in the basal/myoepithelial cells of the breast, including stratified epithelial cytokeratins 5/6, 14 and 17. BRCA1-associated tumours are more likely to be estrogen receptor (ER), progesterone receptor (PR) and HER2 negative and to harbor mutations in the TP53 gene than age-matched sporadic breast cancers [15, 16]. BRCA2-associated tumours are also predominantly high-grade invasive ductal carcinomas of no special type but they often demonstrate a luminal phenotype despite their high histologic grade [13, 17]. Adjusting for grade, BRCA2-associated tumours are more often ER-positive and are less likely, compared with controls, to express the basal cytokeratin CK5 or to overexpress HER2/neu protein . Establishing the estrogen receptor status of a breast cancer (positive or negative) reflects a major subdivision in breast cancer type (at least five major sub-types are recognized) and it is becoming clear that the risk factors associated with breast cancer, both genetic and epidemiological, differ according to sub-type. Genome-wide association studies (GWAS) in breast cancer have identified several common alleles (single nucleotide polymorphisms (SNPs)) associated with an increased risk of breast cancer in the general population [18–25]. Many of these SNPs are associated with risk for ER-positive breast cancer, fewer have so far been associated with ER-negative breast cancer risk [26, 27]. Known risk breast cancer susceptibility alleles have been genotyped in a large series of female BRCA1 and BRCA2 mutation carriers assembled by the Consortium of Investigators of Modifiers of BRCA1/2 (CIMBA) to evaluate their associations with risk of breast cancer for mutation carriers. Of the 12 SNPs (rs2981582 in FGFR2, rs3803662 in TOX3/TNRC9, rs889312 in MAP3K1, rs13281615 at 8q24, rs381798 in LSP1, rs13387042 at 2q35, rs4973768 in SLC4A7/NEK10, rs10941679 at 5p12, rs6504950 in STXBP4/COX11, rs999737/rs10483813 in RAD51L1, rs2046210 at 6q25.1 and rs11249433 at 1p11.2) investigated so far, eight were associated with breast cancer risk for BRCA2 carriers (all but SNPs at 8q24, RAD51L1, 6q25.1 and STXBP4/COX11), whereas only three SNPs (6q25.1, TOX3/TNRC9 and 2q35) were associated with risk for BRCA1 mutation carriers [28–31]. Work from the Breast Cancer Association Consortium and subsequent studies have demonstrated differences in the associations between these susceptibility loci and tumour characteristics in the general population [27, 32]. These results suggest that the observed differences in the associations between BRCA1 and BRCA2 mutation carriers may reflect differences in the distribution of tumour characteristics in mutation carriers. It is currently unclear whether these polymorphisms are associated with different tumour characteristics within BRCA1 and BRCA2 mutation carriers. As an adjunct to predictive testing for a high risk BRCA1 or BRCA2 gene mutation, more individualized risk estimates that take into account additional genetic and environmental modifiers will require a more detailed understanding of how these various risk factors interact. Understanding whether common genetic variants modify the risks of developing ER-positive or ER-negative breast cancer in BRCA1 and BRCA2 mutation carriers could potentially influence the clinical management of these individuals. For example, knowing that a BRCA1 mutation carrier is more likely to develop ER-positive breast cancer (than most BRCA1 mutation carriers), may influence the choice of management strategies, such as chemoprevention. In this study, we used data from the CIMBA consortium to evaluate the associations between the 12 common breast cancer susceptibility alleles and risk for breast cancer defined by ER and PR status. Subjects were BRCA1 and BRCA2 mutation carriers recruited by 36 study centres in Europe, North America and Australia (Table 1). All carriers participated in clinical or research studies at the host institutions, which have been approved by local ethics committees (list provided in Additional file 1, Table S1). Each committee granted approval for access and use of the medical records for the present analyses. The large majority of carriers were recruited through cancer genetics clinics offering genetic testing, and enrolled into national or regional studies. Eligibility to participate in CIMBA is restricted to female carriers of pathogenic BRCA1 or BRCA2 mutations who were 18 years old or older at recruitment. Information collected included the year of birth; mutation description, including nucleotide position and base change; age at last follow-up; ages at breast and ovarian cancer diagnoses; and age or date at bilateral prophylactic mastectomy. Information was also available on the country of residence. Related individuals were identified through a unique family identifier. Women were included in the analysis if they carried mutations that were pathogenic according to generally recognized criteria. Only studies that provided tumour pathology information and had genotype information were included in the analysis. However, to maximise the available information, genotyped mutation carriers within those studies missing information on tumour characteristics were included in the analysis and their disease subtype was assumed to be missing at random (see statistical methods for details). Further details about the CIMBA initiative can be found elsewhere . Tumour pathology data were amalgamated from a range of sources, specifically patient pathology reports, medical records, pathology review data, tumour registry records and results from tissue microarrays. Estrogen and progesterone receptor status was provided as negative or positive, with supplementary immunohistochemistry scoring data and methodology provided when available. Based on definitions supplied, most centres employed a cut off of ≥10% of tumour cells stained positive to define receptor positivity. To ensure consistency across studies, when information on the proportion of cells stained was available, we used the same cut-off to define ER and PR positive tumours. For a small number of cases where composite scoring methods based on the proportion and intensity of staining were available (Allred score, Remmele score and H-score), widely-accepted cut-offs were used (Additional file 1, Table S2). Consistency checks were performed to validate receptor data against supplementary scoring information if provided. This analysis included genotype data on 12 SNPs that had been previously assessed for their associations with the overall risk of breast cancer for BRCA1 and BRCA2 mutation carriers in CIMBA. Genotyping was performed using either the iPLEX or Taqman platforms and has been described in detail in the previous reports [28–31]. To ensure genotyping consistency, all genotyping centres were required to adhere to the CIMBA genotyping quality control criteria which are described in detail online . The 12 SNPs genotyped were rs2981582 in FGFR2, rs3803662 in TOX3/TNRC9, rs889312 in MAP3K1, rs3817198 in LSP1, rs13387042 at 2q35, rs13281615 at 8q24, rs4973768 near SLC4A7/NEK10, rs6504950 in the STXBP4/COX11 region, rs2046210 near ESR1 at 6q25.1 and rs11249433 at 1p11.2. A Taqman assay could not be adequately designed for SNP rs999737 in the RAD51L1 region and studies using this platform genotyped the surrogate SNP rs10483813 (pair-wise r2 = 1 with rs999737 based on HapMap CEU data). Data for these two SNPs were combined and treated as a single locus in the analysis of associations. The aim of this study was to evaluate the associations between each genotype and breast cancer subtypes defined by tumour characteristics in BRCA1 and BRCA2 mutation carriers separately. The phenotype of each individual was defined by the age at diagnosis of breast cancer and its subtype or by age at last follow-up. Individuals were censored at the age of the first breast cancer diagnosis, ovarian cancer diagnosis, or bilateral prophylactic mastectomy or the age at last observation. Mutation carriers censored at ovarian cancer diagnosis were considered unaffected. The analysis of risk modifiers in BRCA1 and BRCA2 mutation carriers is complicated by the fact that mutation carriers are not randomly sampled with respect to their disease status. Many carriers are sampled through families seen in genetic clinics. The first tested individual in a family is usually someone diagnosed with cancer at a relatively young age. Such study designs, therefore, tend to lead to an over-sampling of affected individuals, and standard analytical methods like Cox regression or case-control analysis may lead to biased estimates of the risk ratios . This can be illustrated by considering an individual affected at age t. In a standard analysis of a cohort study or a case-control analysis, the SNP genotype for the individual will be compared with those of all individuals at risk at age t or in a case-control analysis, with controls randomly sampled from all possible at risk individuals. This analysis leads to consistent estimates of the hazard ratio or odds ratio estimates. However, in the present design, mutation carriers are already selected on the basis of disease status (where affected individuals are over-sampled). If standard cohort analysis were applied to these data, it would lead to affected individuals at age t being compared to unaffected carriers selected on the basis of their future disease status. If the genotype is associated with the disease, the risk estimate will be biased to zero because too many affected individuals (in whom the at-risk genotype is overrepresented) are included in the comparison group. Simulation studies have shown that this effect can be quite marked . To address this, a retrospective likelihood approach was previously proposed, which models the observed genotypes conditional on the disease phenotypes . For the current analyses we have extended this method to model the simultaneous effect of each SNP on more than one tumour subtype. We briefly describe this method for the analysis of associations with ER-positive and ER-negative breast cancer, but the same principles apply for the analysis of associations with other tumour characteristics. The likelihood in equation 1 can then be maximised jointly over the log-risk ratios βand γ, genotype frequencies P(g) and the age and subtype-specific frequencies π+(t) and π-(t) This likelihood is based on the assumption that the ascertainment of mutation carriers is dependent on the overall disease phenotype (breast cancer) but not on tumour subtypes. This allows the subtype frequencies π+(t) and π - (t) to be estimated within the dataset. Relaxing this assumption and conditioning also on tumour subtype requires external estimates for the age and subtype-specific frequencies π+(t) and π-(t). The effect of each SNP was modelled either as a per-allele HR (multiplicative model) or as separate HRs for heterozygotes and homozygotes, and these were estimated on the logarithmic scale. Heterogeneity in the hazard ratios between tumour subtypes was examined by fitting models where v(t i ) = v0(t i ) exp (β1g) and μ(t i ) = μ0(t i ) exp (β1 + β2)g) with g = 0,1 and 2 (for 0, 1, 2 copies of the minor allele respectively) and testing for β2 = 0. Analyses were carried out with the pedigree-analysis software MENDEL . All analyses were stratified by country of residence and used calendar-year- and cohort-specific cancer incidences for BRCA1 and BRCA2 . For this purpose, a stratified version of the retrospective likelihood (equation 1) was derived as described previously . Countries with small numbers of mutation carriers were grouped together. We used a robust variance-estimation approach to allow for the non-independence among related mutation carriers . Based on our results we computed the predicted absolute risk of developing ER-negative and ER-positive breast cancer for BRCA1 and BRCA2 mutation carriers by the combined 12 SNP profile. For each individual we derived an empirical score, based on the per-allele log-relative hazard estimates for each genotype, which was of the form ∑ j = 1 12 β j g j where β j is the per-allele log-hazard estimate for locus j and g j is the genotype at the same locus (taking values 0, 1 and 2). This assumes a multiplicative model for the combined SNP associations. This is a reasonable assumption given that previous analyses found no evidence of departure from the multiplicative model . Scores were calculated for ER-positive and ER-negative disease, separately for BRCA1and BRCA2 mutation carriers. The empirical distribution of the derived score was then used to compute the subtype specific incidence associated with each multilocus genotype as described previously . We reported the absolute risks of developing ER-specific breast cancer at the 5th, 50th and 95th percentiles of the empirical distribution of the SNP profile. A total of 11,421 BRCA1 and 7,080 BRCA2 mutation carriers from 36 studies had been successfully genotyped for at least one of the12 SNPs and were eligible for inclusion in these analyses. 9,815 BRCA1 and BRCA2 mutation carriers were censored at a first invasive breast cancer diagnosis, of whom 4,310 had information on either ER or PR (Table 1). There were significant differences in the HR for ER-positive and ER-negative disease for BRCA1 mutation carriers for two SNPs (Table 2). The FGFR2 SNP rs2981582 exhibited the clearest difference with a strong association for ER-positive disease but not ER-negative disease (per allele HR = 1.35, 95% CI: 1.17 to 1.56, for ER-positive compared with HR = 0.91, 95% CI: 0.85 to 0.98 for ER-negative, P-heterogeneity = 6.5 × 10-6). The SLC4A7/NEK10 SNP rs4973768 also exhibited a similar pattern (ER-positive: per-allele HR = 1.17, 95% CI: 1.03 to 1.133, compared with ER-negative: per-allele HR = 0.99, 95% CI: 0.93 to 1.06, P-heterogeneity = 0.027). Although there was no significant evidence of differences between the HRs for ER-positive and ER-negative breast cancer, the TOX3/TNRC9 SNP rs3803662 was significantly associated with the risk of ER-positive disease (per-allele HR = 1.25, 95% CI: 1.06 to .46, P-trend = 0.0062) but not with risk for ER-negative breast cancer (per-allele HR = 1.05, 95% CI: 0.97 to 1.13, P-trend = 0.21). LSP1 SNP rs3817198 was associated with the risk of ER-negative breast cancer (per-allele HR = 1.07, 95% CI: 1.00 to 1.07, P-trend = 0.047) but not with risk of ER-positive breast cancer (per-allele HR = 1.07, 95% CI: 0.93 to 1.22, P-trend = 0.33, P-het = 0.98). The 6q25.1 SNP rs2046210 near ESR1 was associated with the risk for both ER-negative (per-allele HR = 1.19, 95% CI: 1.11 to 1.27, P-trend = 2.4 × 10-7) and ER-positive (per-allele HR = 1.14, 95% CI: 1.01 to 1.30, P-trend = 0.043) breast cancer. There was no significant evidence of association with either ER-negative or ER-positive breast cancer for any of the other SNPs, although the HR estimates tended to be higher for ER-positive breast cancer (for example, SNPs rs13387042 at 2q35 and rs13281615 at 8q24). Only SNP rs2046210 at 6q25.1 exhibited differential associations between ER-positive and ER-negative breast cancer for BRCA2 mutation carriers (P-heterogeneity = 0.045, Table 3). The per-allele HR for ER-negative disease was estimated to be 1.17 (95% CI: 0.99 to 1.38) whereas the per-allele HR for ER-positive breast cancer was 0.97 (95% CI: 0.89 to 1.05). Although there were no significant differences in the associations between the two types of disease for BRCA2 mutation carriers, the HR estimates for ER-positive disease tended to be larger compared to ER-negative breast cancer. SNPs at/near FGFR2, TOX3/TNRC9, MAP3K1, LSP1, 2q35, SLC4A7/NEK10, 5p12 and 1p11.2 were associated with ER-positive breast cancer for BRCA2 mutation carriers (using either a per-allele or 2 df genotype test). The strongest associations were for the FGFR2 rs2981582 SNP (HR for ER-positive breast cancer = 1.35, 95% CI: 1.23 to 1.48, P-trend = 1.4 × 10-10) and TOX3/TNRC9 SNP rs3803662 (HR for ER-positive breast cancer = 1.28. 95% CI: 1.16 to 1.41, P-trend = 1.5 × 10-6). Only SNPs at or near MAP3K1, STXBP4/COX11 and 6q25.1 were associated with the risk of ER-negative breast cancer for BRCA2 mutation carriers. The general pattern of associations with PR-positive and PR-negative breast cancer for BRCA1 mutation carriers (Additional file 1, Table S3) was similar to that seen for ER status. Significant differences in the associations between PR-positive and PR-negative breast cancer were observed for three SNPs. The minor allele of FGFR2 SNP rs2981582 was associated with a significantly higher risk for PR-positive breast cancer for BRCA1 mutation carriers (per-allele HR for PR-positive = 1.29, 95% CI: 1.10 to 1.51, HR for PR-negative = 0.93, 95% CI: 0.87 to 1.00, P-heterogeneity = 7 × 10-4). Allele "A" of SNP rs13387042 at 2q35 was associated with a significantly higher risk of PR-positive breast cancer for BRCA1 mutation carriers (HR for PR-positive breast cancer = 1.16, 95% CI: 1.01 to 1.33; HR for PR-negative = 0.97, 95% CI: 0.91 to 1.04, P-heterogeneity = 0.034). Although the RAD51L1 SNP showed no differential associations with ER-status, there was evidence that the minor allele of this SNP was associated with a lower risk of PR-positive breast cancer (HR for PR-positive = 0.79, 95% CI: 0.61 to 0.95; HR for PR-negative = 1.02, 95% CI: 0.94 to 1.11; P-heterogeneity = 0.027). The only SNPs associated with risk for PR-negative breast cancer were SNPs at 6q25.1 (per-allele HR = 1.19, 95% CI: 1.11 to 1.27, P-trend = 3.7 × 10-7), and in LSP1 (per-allele HR = 1.09, 95% CI: 1.01 to 1.16, P-trend = 0.017), but these were not significantly different from the associations with PR-positive breast cancer for BRCA1 mutation carriers. Only two SNPs demonstrated significant differences in the associations with PR-positive and PR-negative breast cancer for BRCA2 mutation carriers (Additional file 1, Table S4). SNP rs13387042 at 2q35 was associated with a higher risk of PR-positive breast cancer (per-allele HR for PR-positive = 1.14, 95% CI: 1.03 to 1.25; per-allele HR for PR-negative = 0.92, 95% CI: 0.81 to 1.04, P-heterogeneity = 0.009). SNP rs10941679 at 5p12 was also associated with a higher risk of PR-positive breast cancer for BRCA2 mutation carriers (per-allele HR for PR-positive = 1.15. 95% CI: 1.03 to 1.27, HR for PR-negative = 0.94, 95% CI: 0.81 to 1.09, P-heterogeneity = 0.028). SNPs near or at FGFR2, TOX3/TNRC9, LSP1 were associated with both PR-negative and PR-positive breast cancer, whereas the 1p11.2 SNP was associated with risk for PR-negative breast cancer. MAP3K1 and SLC4A7/NEK10 were associated only with risk of PR-positive breast cancer among BRCA2 mutation carriers. Using the estimated HRs for ER-positive and ER-negative breast cancer for BRCA1 and BRCA2 mutation carriers, we computed the predicted absolute risk of developing ER-negative and ER-positive breast cancer at various percentiles of the combined SNP distribution. The SNP profile distribution is different for each disease subtype and mutation. We note that SNPs for which the per-allele HR estimates are close to 1.0 contribute little to the predicted ER-specific risks. 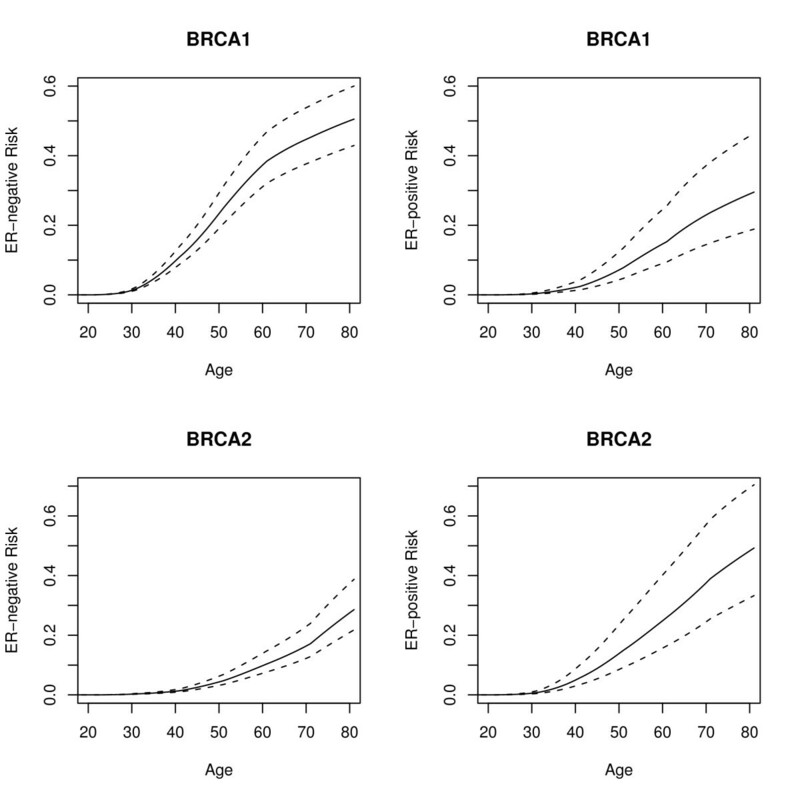 Figure 1 shows the predicted risks of developing ER-negative and ER-positive breast cancer for BRCA1 and BRCA2 mutation carriers at the 5th, 50th and 95th percentiles of the empirical risk distribution of the combined SNP profile. A BRCA1 mutation carrier at the 5th percentile of the SNP profile distribution would be at 43% risk of developing ER-negative breast cancer by age 80 compared with 60% for BRCA1 mutation carriers at the 95th percentile of the risk distribution. The risks of developing ER-positive breast cancer would be 18% and 46% by age 80 at the 5th and 95th percentiles of the ER-positive breast cancer risk distribution. BRCA2 mutation carriers at the 5th percentile of the ER-negative breast cancer risk distribution are predicted to have a 22% risk of developing ER-negative breast cancer by age 80 compared with 39% for the 95th percentile of the risk distribution. The risks of developing ER-positive breast cancer by age 80 for BRCA2 carriers varied from 33% to 70% at the 5th and 95th percentiles of the ER-positive risk distribution respectively. Predicted risks of developing ER-negative and ER-positive breast cancer based on SNP profiles. Solid lines depict the median risks and dotted lines the risks at the 5th and 95th percentiles of the risk distribution. The absolute risk differences between individuals at the extremes of the risk distributions are greater for ER-positive breast cancer. 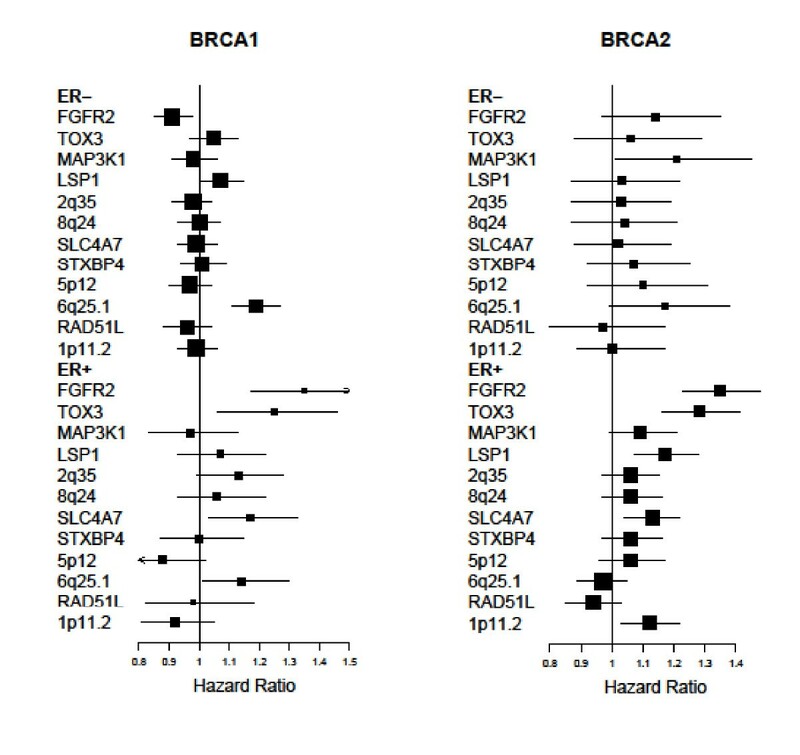 This is the first report to investigate the associations between 12 common breast cancer susceptibility alleles and ER and PR status of breast tumours in BRCA1 and BRCA2 mutation carriers. The analysis was made possible by the availability of a large, combined dataset with genotype and tumour pathology information in mutation carriers collated through the CIMBA consortium. The majority of the SNPs examined demonstrated stronger associations with ER-positive breast cancer for both BRCA1 and BRCA2 mutation carriers (Figure 2). Only rs2046210 on 6q25.1 exhibited stronger evidence for ER-negative disease. Among BRCA1 mutation carriers, the most marked difference was for SNP rs2981582 in FGFR2, which was strongly associated with ER-positive breast cancer and exhibited no evidence of an association with ER-negative breast cancer (P = 6.5 × 10-6). Previous analyses of this polymorphism in mutation carriers failed to find an association with the overall risk of breast cancer for BRCA1 mutation carriers, but found an association with risk for BRCA2 mutation carriers [29, 31]. Our results suggest that rs2981582 in FGFR2 also modifies ER-positive breast cancer risk for BRCA1 mutation carriers to a similar relative extent as in BRCA2 mutation carriers and ER-positive disease in the general population [27, 32]. Similar patterns were observed for SNPs rs3803662 in TOX3/TNRC9 and rs4973768 in SLC4A7/NEK10 in which the associations were predominantly with ER-positive breast cancer for both BRCA1 and BRCA2 mutation carriers, in line with results from studies of breast cancer in the general population [18, 21, 27]. The HR estimates for ER-positive breast cancer in BRCA1 and BRCA2 mutation carriers for these SNPs were very similar. Summary of per-allele HR estimates for ER-positive and ER-negative breast cancer for mutation carriers. The patterns of per-allele HR estimates (taken from Tables 2 and 3) suggest that the breast cancer subtype specific associations are similar between BRCA1 and BRCA2 mutation carriers. Among the 12 SNPs investigated in this report, SNP rs2046210 at 6q25.1 exhibited the strongest association with the risk of breast cancer for BRCA1 mutation carriers in previous analyses, and was not associated with risk for BRCA2 mutation carriers . The current results suggest that this was mainly driven by an association with ER-negative breast cancer risk. This observation is again consistent with the effects seen in population-based studies, in which the relative risk is higher for ER-negative than ER-positive disease [42, 43] (Alison Dunning, personal communication). There was some evidence that the 6q25.1 SNP is also associated with ER-negative disease cancer subtype in BRCA2 mutation carriers, although the estimates for ER-negative breast cancer in BRCA2 mutation carriers are imprecise due to the relatively small sample size. In addition to the 12 loci investigated in this report, a recently identified locus at 19p13 also appears to be predominantly associated with ER-negative breast cancer . The patterns of association between the SNPs and PR tumour status were similar to those observed for ER, which is not surprising given that ER and PR expression are highly correlated. There were, however, two notable exceptions. The 2q35 SNP rs13387042 demonstrated significantly stronger associations with PR-positive than PR-negative breast cancer for both BRCA1 and BRCA2 mutation carriers (P = 0.034 and P = 0.0086, for PR-positive for BRCA1 and BRCA2 respectively), suggesting this SNP may be more relevant for BRCA1 and BRCA2 tumours expressing PR. However, a population-based study has found this SNP is also associated with PR-negative breast cancer . Furthermore, the RAD51L1 locus was associated with PR-positive breast cancer for BRCA1 mutation carriers and the magnitude of the association was similar to that observed in the general population  (A.B. Spurdle, personal communication). Previous studies demonstrated that SNPs, which are associated with ER-positive breast cancer in the general population, tend to be associated with the breast cancer risk for BRCA2 mutation carriers and SNPs, which are associated with ER-negative breast cancer in the general population, tend to be associated with the breast cancer risk for BRCA1 mutation carriers [27, 31, 44–46]. The current results demonstrate that despite lack of an association between a SNP and the overall breast cancer risk for BRCA1 or BRCA2 mutation carriers, residual associations exist with specific disease subtypes. Figure 2 summarises the association patterns in BRCA1 and BRCA2 mutation carriers. The HR estimates for ER-positive and ER-negative breast cancer among BRCA1 mutation carriers appear to be different (intraclass correlation coefficient (ICC) approximately 0), as are the HR estimates for ER-positive and ER-negative breast cancer among BRCA2 mutation carriers (ICC = 0.13). On the other hand the HR estimates for ER-positive breast cancer among BRCA1 and BRCA2 mutation carriers appear to be more similar (ICC = 0.65). There is, however, little correlation in the HR estimates for ER-negative breast cancer among BRCA1 and BRCA2 mutation carriers (ICC = 0.05). However, SNP 6q25.1, which is mainly associated with ER-negative disease in BRCA1 mutation carriers, is estimated to confer similar HRs for ER-negative breast cancer for both BRCA1 and BRCA2 mutation carriers. These associations are mainly in the same direction and of similar magnitude to those observed with breast cancer in the general population stratified by ER expression status. Taken together, these findings are consistent with a model in which these SNPs and BRCA1 or BRCA2 mutations combine multiplicatively on the risk for ER-positive or ER-negative breast cancer . Hence, the apparent differences in the strength of the SNP associations by BRCA1 and BRCA2 mutation status can be explained once tumour subtype is taken into account. The major strength of the current study is the large sample of BRCA1 and BRCA2 mutation carriers with SNP and tumour marker information. Despite the large sample size, ER and PR marker information was only available for approximately 30% of the mutation carriers that had been diagnosed with breast cancer. The sample sizes for tumour subtypes, while still large, were, therefore, much smaller than were available for analyses of breast cancer risk overall, particularly for ER-positive breast cancer in BRCA1 carriers and ER-negative breast cancer in BRCA2 carriers. However, by analysing the data using a retrospective cohort approach and analysing the associations with ER-positive and ER-negative disease simultaneously we were able to include all mutation carriers in the analysis, including affected individuals with missing ER status, thus maximizing the available information. Ongoing efforts by CIMBA aim to increase the proportion of mutation carriers diagnosed with breast cancer who also have available tumour pathology information. This will enable us to assess the associations with breast cancer subtypes with greater precision. The majority of the mutation carriers in CIMBA are identified through clinical genetics centers and, therefore, the source of information or definition of tumour marker status could vary across studies. This heterogeneity in classification may attenuate some of the differences by tumour type. For example, most commonly, a cut-off of 10% of cells staining was taken to denote positivity for ER and PR by the centers without further information on intensity or proportion of positive tumour nuclei and this was used for all our analyses; however, in centers that use the Allred score, a value of > 2 denoted positivity, which may reflect as few as 1% of cells staining. In fact, recent recommendations suggest that ER and PgR assays be considered positive, for therapeutic purposes, if there are at least 1% positive tumour nuclei , but these data were not available for the majority of carriers in our samples to enable reclassification. It has been shown, however, that ER is almost always diffusely positive or completely negative (that is, it shows a bimodal staining pattern) with few cases falling between these extremes . Given the small number of tumours likely to fall into the1 to 9% of cells staining category, the impact of changing the cutoff to 1% on our results would be limited. Furthermore, there was no evidence of variation in the distributions of ER or PR status across the studies separately for BRCA1 and BRCA2 tumours (Mavaddat N, Antoniou AC, personal communication, manuscript in preparation) and all analyses were stratified by country. Finally, the clear differences observed for some SNPs (most notably for FGFR2 rs2981582, where the association was limited to ER-positive disease) suggest that the effect of misclassification in tumour subtype on the SNP associations is likely to have been small. BRCA1 and BRCA2 tumours have also been found to differ in terms of other tumour characteristics compared to breast cancers in the general population. For example, tumours in mutation carriers are more likely to be of higher grade in comparison to breast cancers in the general population. The distribution of grade has been found to vary between ER-positive and ER-negative tumours in both BRCA1 and BRCA2 mutation carriers (Mavaddat N, Antoniou AC, personal communication, manuscript in preparation). Although the number of carriers with information on grade, ER status and SNPs was too small to permit combined analysis, our results are unlikely to have been influenced after adjusting for tumour grade. Case-only analysis to test for differences in associations between the SNPs and tumour grade (using ordinal logistic regression) revealed no significant associations between any of the SNPs and grade for both BRCA1 and BRCA2 mutation carriers (P > 0.05 for all tests, results not shown). The analysis was performed within a retrospective cohort approach, by extending the retrospective likelihood approach described previously  to model the simultaneous effects on different breast cancer subtypes defined by ER/PR. Under this approach the associations were estimated simultaneously for the tumour subtypes under investigation. This method depends on the assumption that ascertainment of mutation carriers does not depend on tumour subtypes. This is a reasonable assumption since more than 90% of mutation carriers in our sample were recruited prior to 2007, when it was uncommon to use tumour pathology in selecting individuals for BRCA1 and BRCA2 mutation screening. Furthermore, the results were virtually identical in a case only, logistic regression analysis for testing for differences in the associations with tumour subtypes which included only individuals with known tumour characteristics (results not shown). The average risks of developing ER-positive and ER-negative breast cancer in both BRCA1 and BRCA2 mutation carriers are substantially higher compared to the general population . Therefore, in combination, these SNPs lead to much bigger differences in the absolute risk of developing the disease subtypes between the extremes of the combined SNP genotype distributions . Based on the SNP profiles investigated in this report, the absolute risk difference between mutation carriers at the top 5% of the risk distribution compared to the bottom 5% is much greater for ER-positive breast cancer than for ER-negative breast cancer for both BRCA1 and BRCA2 (Figure 1). Recent GWAS have identified several other common breast cancer susceptibility variants which have not been investigated in BRCA1 and BRCA2 mutation carriers yet [24, 51]. Moreover, ongoing GWAS in BRCA1 and BRCA2 mutation carriers [44, 52] may also identify further modifiers of breast cancer risk for mutation carriers. It will be important to investigate the associations of these variants with different disease subtypes in BRCA1 and BRCA2 mutation carriers. Currently, it is unusual for the risks of different disease subtypes to be taken into account in the genetic counseling process. However, as more risk modifying variants are identified in the future, provided these have different associations with different disease subtypes in mutation carriers and confer relative risks which are greater (or smaller) than 1, having precise breast cancer subtype risks may be useful for the planning of the clinical management of both BRCA1 and BRCA2 mutation carriers. For example, knowing that a female BRCA1 mutation carrier was primarily at risk of ER-positive breast cancer based on her associated SNP profile (rather than ER-negative breast cancer, as is the case for the majority of cases) might potentially influence the choice of clinical management by screening, chemoprevention or prophylactic surgery. In summary, in this report we investigated the associations of common breast cancer polymorphisms with ER and PR status. Our results indicate there are differential associations between these SNPs and the risk of developing ER-positive or ER-negative breast cancer in BRCA1 and BRCA2 mutation carriers that mirror similar differences seen in the general population. The findings add to our understanding of the biology of tumour development in mutation carriers and as more risk variants are identified in the future they may improve clinical management of these individuals. This work was supported by Cancer Research UK grants C12292/A11174 and C1287/A10118. The research leading to these results has received funding from the European Community's Seventh Framework Programme under grant agreement n° 223175 (HEALTH-F2-2009-223175). ACA is a CR-UK Senior Cancer Research Fellow, DFE is CR-UK Principal Research Fellow. This work was supported by the National Cancer Institute, National Institutes of Health under RFA-CA-06-503 and through cooperative agreements with members of the Breast Cancer Family Registry (BCFR) and Principal Investigators, including Cancer Care Ontario (U01 CA69467), Columbia University (U01 CA69398), Fox Chase Cancer Center (U01 CA69631), Huntsman Cancer Institute (U01 CA69446), Cancer Prevention Institute of California (formerly the Northern California Cancer Center) (U01 CA69417), University of Melbourne (U01 CA69638), and Research Triangle Institute Informatics Support Center (RFP No. N02PC45022-46). Samples from the FCCC, HCI, and CPIC were processed and distributed by the Coriell institute for Medical Research. The content of this manuscript does not necessarily reflect the views or policies of the National Cancer Institute or any of the collaborating centers in the BCFR, nor does mention of trade names, commercial products or organizations imply endorsement by the US Government or the BCFR. Lithuania: This work is supported by the Research Council of Lithuania grant LIG-19/2010 to Ramunas Janavicius. Latvia: We acknowledge Genome Database of Latvian Population, Latvian Biomedical Research and Study Center for providing data and DNA samples. This work is supported by Liepaja's municipal council to Laima Tihomirova (Latvian Biomedical Research and Study Centre). The study was supported by the DKFZ. The CONSIT TEAM is supported by grants from Associazione Italiana per la Ricerca sul Cancro (4017) and by funds from Italian citizens who allocated the 5 × 1,000 share of their tax payment in support of the Fondazione IRCCS Istituto Nazionale Tumouri, according to Italian laws (INT-Institutional strategic projects "5 × 1000") to PP and grants from Fondazione Italiana per la Ricerca sul Cancro (Special Project "Hereditary tumours"), Ministero della Salute (Extraordinary National Cancer Program 2006 "Alleanza contro il Cancro", and "Progetto Tumouri Femminili") and Ministero dell'Universita' e Ricerca (RBLAO3-BETH) to PR. CONSIT TEAM acknowledges the contribution of Gaia Roversi, Carla B. Ripamonti, Marilena Morganti and Marco Pierotti of the of the Fondazione IRCCS Istituto Nazionale dei Tumouri, Milan, Italy; Monica Barile of the Istituto Europeo di Oncologia, Milan, Italy and Liliana Varesco of the Istituto Nazionale per la Ricerca sul Cancro, Genoa, Italy. EMBRACE Collaborating Centers are: Coordinating Centre, Cambridge: Steve Ellis, Elena Fineberg, Radka Platte. North of Scotland Regional Genetics Service, Aberdeen: Zosia Miedzybrodzka. Northern Ireland Regional Genetics Service, Belfast: Patrick Morrison, Lisa Jeffers. West Midlands Regional Clinical Genetics Service, Birmingham: Trevor Cole, Kai-ren Ong, Jonathan Hoffman. South West Regional Genetics Service, Bristol: Margaret James. East Anglian Regional Genetics Service, Cambridge: Joan Paterson, Sarah Downing, Amy Taylor. Medical Genetics Services for Wales, Cardiff: T. Rogers,. St James's Hospital, Dublin & National Centre for Medical Genetics, Dublin: M. John Kennedy, David Barton. South East of Scotland Regional Genetics Service, Edinburgh: Mary Porteous, Sarah Drummond. Peninsula Clinical Genetics Service, Exeter: Carole Brewer, Emma Kivuva, Anne Searle, Selina Goodman, Kathryn Hill. West of Scotland Regional Genetics Service, Glasgow: Victoria Murday, Nicola Bradshaw, Lesley Snadden, Mark Longmuir, Catherine Watt, Sarah Gibson, Eshika Haque, Ed Tobias, Alexis Duncan. South East Thames Regional Genetics Service, Guy's Hospital London: Chris Jacobs, Caroline Langman, Anna Whaite. North West Thames Regional Genetics Service, Harrow. Leicestershire Clinical Genetics Service, Leicester. Yorkshire Regional Genetics Service, Leeds: Carol Chu, Julie Miller. Cheshire and Merseyside Clinical Genetics Service, Liverpool: Ian Ellis. Manchester Regional Genetics Service, Manchester: Jane Taylor. North East Thames Regional Genetics Service, NE Thames, London: Alison Male, Cheryl Berlin. Nottingham Centre for Medical Genetics, Nottingham: Rebecca Collier. Northern Clinical Genetics Service, Newcastle: Fiona Douglas, Oonagh Claber, Irene Jobson. Oxford Regional Genetics Service, Oxford: Lisa Walker, Diane McLeod, Dorothy Halliday, Sarah Durell, Barbara Stayner. The Institute of Cancer Research and Royal Marsden NHS Foundation Trust: Susan Shanley, Nazneen Rahman, Richard Houlston, Elizabeth Bancroft, Lucia D'Mello, Elizabeth Page, Audrey Ardern-Jones, Kelly Kohut, Jennifer Wiggins, Elena Castro, Anita Mitra, Lisa Robertson. North Trent Clinical Genetics Service, Sheffield: Oliver Quarrell, Cathryn Bardsley. South West Thames Regional Genetics Service, London: Shirley Hodgson, Sheila Goff, Glen Brice, Lizzie Winchester, Charlotte Eddy, Vishakha Tripathi, Virginia Attard. Wessex Clinical Genetics Service, Princess Anne Hospital, Southampton: Anneke Lucassen, Gillian Crawford, Donna McBride, Sarah Smalley. EMBRACE is supported by Cancer Research UK Grants C1287/A10118 and C1287/A11990. D. Gareth Evans and Fiona Lalloo are supported by an NIHR grant to the Biomedical Research Centre, Manchester. The Investigators at The Institute of Cancer Research and The Royal Marsden NHS Foundation Trust are supported by an NIHR grant to the Biomedical Research Centre at The Institute of Cancer Research and The Royal Marsden NHS Foundation Trust. Ros Eeles, Elizabeth Bancroft and Lucia D'Mello are also supported by Cancer Research UK Grant C5047/A8385. A.K.G. was funded by U01CA69631, 5U01CA113916, and the Eileen Stein Jacoby Fund. The author acknowledges support from The University of Kansas Cancer Center and the Kansas Bioscience Authority Eminent Scholar Program. A.K.G. is the Chancellors Distinguished Chair in Biomedical Sciences endowed Professor. Work is supported by the Familial Cancer Registry (CI) and the Tissue Culture Shared Registry at Georgetown University (NIH/NCI grant P30-CA051008), the Cancer Genetics Network (HHSN261200744000C) (CI), and Swing Fore the Cure (CI). GC-HBOC is supported by a grant of the German Cancer Aid (grant 109076), the Centre of Molecular Medicine Cologne (CMMC). The study was supported by the Ligue National Contre le Cancer; Association for International Cancer Research Grant (AICR-07-0454); and the Association "Le cancer du sein, parlons-en!" Award. We wish to thank all the GEMO collaborating groups for their contribution to this study. GEMO Collaborating Centers are: Coordinating Centres, Unité Mixte de Génétique Constitutionnelle des Cancers Fréquents, Centre Hospitalier Universitaire de Lyon/Centre Léon Bérard, et Equipe «Génétique du cancer du sein», Centre de Recherche en Cancérologie de Lyon: Laure Barjhoux, Carole Verny-Pierre, Sophie Giraud, and Service de Génétique Oncologique, Institut Curie, Paris: Marion Gauthier-Villars, Bruno Buecher, Claude Houdayer, Muriel Belotti, Carole Tirapo, Antoine de Pauw. Institut Gustave Roussy, Villejuif: Brigitte Bressac-de-Paillerets, Audrey Remenieras, Véronique Byrde, Olivier Caron, Gilbert Lenoir. Centre Jean Perrin, Clermont-Ferrand: Yves-Jean Bignon, Nancy Uhrhammer. Centre Léon Bérard, Lyon: Christine Lasset, Valérie Bonadona. Centre François Baclesse, Caen. Institut Paoli Calmettes, Marseille: Hagay Sobol, Violaine Bourdon, Tetsuro Noguchi, François Eisinger. Groupe Hospitalier Pitié-Salpétrière, Paris: Florence Coulet, Chrystelle Colas, Florent Soubrier. CHU de Arnaud-de-Villeneuve, Montpellier. Centre Oscar Lambret, Lille: Jean-Philippe Peyrat, Joëlle Fournier, Françoise Révillion, Philippe Vennin, Claude Adenis. Hôpital René Huguenin/Institut Curie, St Cloud: Etienne Rouleau, Rosette Lidereau, Liliane Demange, Catherine Nogues. Centre Paul Strauss, Strasbourg. Institut Bergonié, Bordeaux: Emmanuelle Barouk-Simonet, Françoise Bonnet, Virginie Bubien. Institut Claudius Regaud, Toulouse: Christine Toulas, Rosine Guimbaud, Laurence Gladieff, Viviane Feillel. CHU de Grenoble: Dominique Leroux, Hélène Dreyfus, Christine Rebischung, Magalie Peysselon. CHU de Dijon: Fanny Coron, Laurence Faivre. CHU de St-Etienne: Fabienne Prieur. Hôtel Dieu Centre Hospitalier, Chambéry: Sandra Fert Ferrer. Centre Antoine Lacassagne, Nice: Marc Frénay. CHU de Limoges: Laurence Vénat-Bouvet. CHU de Nantes: Capucine Delnatte. CHU Bretonneau, Tours. Creighton University, Omaha, USA: Henry T.Lynch, Carrie L.Snyder. HEBON Collaborating Centers: Coordinating center: Netherlands Cancer Institute, Amsterdam, NL: FBL Hogervorst, S Verhoef, M Verheus, LJ van 't Veer, FE van Leeuwen; Erasmus Medical Center, Rotterdam, NL: M Collée, AMW van den Ouweland, A Jager, MJ Hooning; Leiden University Medical Center, NL, Leiden: CJ van Asperen, JT Wijnen, MP Vreeswijk, RA Tollenaar, P Devilee; Radboud University Nijmegen Medical Center, Nijmegen, NL: MJ Ligtenberg, N Hoogerbrugge; University Medical Center Utrecht, Utrecht, NL: MG Ausems; Amsterdam Medical Center, NL: CM Aalfs; VU University Medical Center, Amsterdam, NL: JJP Gille, Q Waisfisz, HEJ Meijers-Heijboer; University Hospital Maastricht, Maastricht, NL: EB Gomez-Garcia, CE van Roozendaal, Marinus J Blok, B Caanen; University Medical Center Groningen University, NL: JC Oosterwijk, AH van der Hout, MJ Mourits; The Netherlands Foundation for the detection of hereditary tumours, Leiden, NL: HF Vasen. The HEBON study is supported by the Dutch Cancer Society grants NKI1998-1854, NKI2004-3088, NKI2007-3756 and the ZonMW grant 91109024. HEBCS acknowledge Drs. Kirsimari Aaltonen, Carl Blomqvist and Päivi Heikkilä and research nurse Irja Erkkilä for their help with the patient data and samples. The HEBCS study has been financially supported by the Helsinki University Central Hospital Research Fund, Academy of Finland (132473), the Finnish Cancer Society, and the Sigrid Juselius Foundation. We would like to thank Martine Tranchant for skillful technical assistance. J.S. is Chairholder of the Canada Research Chair in Oncogenetics. This work was supported by the Canadian Institutes of Health Research for the "CIHR Team in Familial Risks of Breast Cancer" program and by the Canadian Breast Cancer Research Alliance-grant #019511. The ILUH group was supported by the Icelandic Association "Walking for Breast Cancer Research" and by the Landspitali University Hospital Research Fund. We wish to thank Heather Thorne, Eveline Niedermayr, all the kConFab research nurses and staff, the heads and staff of the Family Cancer Clinics, and the Clinical Follow Up Study (funded 2001-2009 by NHMRC and currently by the National Breast Cancer Foundation and Cancer Australia #628333) for their contributions to this resource, and the many families who contribute to kConFab. kConFab is supported by grants from the National Breast Cancer Foundation, the National Health and Medical Research Council (NHMRC) and by the Queensland Cancer Fund, the Cancer Councils of New South Wales, Victoria, Tasmania and South Australia, and the Cancer Foundation of Western Australia. ABS and GCT are NHMRC Fellows. The MAYO study was supported by NIH grants CA116167, CA128978, a Specialized Program of Research Excellence (SPORE) in Breast Cancer (CA116201), and awards from the Komen Foundation for the Cure and the Breast Cancer Research Foundation. The research of Drs. PL Mai and MH Greene was supported by the Intramural Research Program of the US National Cancer Institute, and by support services contracts NO2-CP-11019-50 and N02-CP-65504 with Westat, Inc., Rockville, MD. This work has been supported by the Russian Federation for Basic Research (grants 10-04-92601, 10-04-92110, 11-04-00227), the Federal Agency for Science and Innovations (contract 02.740.11.0780), the Commission of the European Communities (grant PITN-GA-2009-238132) and through a Royal Society International Joint grant (JP090615). We wish to thank Mona Gill, Lucine Collins, Nalan Gokgoz, Teresa Selander, Nayana Weerasooriya and members of the Ontario Cancer Genetics Network for their contributions to the study. This work was supported by the Ohio State University Comprehensive Cancer Center. We thank Kevin Sweet and Leigha Senter for accrual of study participants and data management. The Human Genetics Sample bank prepared DNA samples and the OSU Nucleic Acids Shared Resource assisted with genotyping. SWE-BRCA collaborators: Margareta Nordling, Annika Bergman and Zakaria Einbeigi, Gothenburg, Sahlgrenska University Hospital; Sigrun Liedgren, Linköping University Hospital; Åke Borg, Niklas Loman, Håkan Olsson, Ulf Kristoffersson, Helena Jernström, Katja Harbst, Lund University Hospital; Annika Lindblom, Annelie Liljegren, Gisela Barbany-Bustinza and Johanna Rantala, Stockholm, Karolinska University Hospital; Beatrice Melin, Henrik Grönberg, Eva-Lena Stattin and Monica Emanuelsson, Umeå University Hospital; Hans Ehrencrona, Richard Rosenquist and Niklas Dahl, Uppsala University Hospital. UKFOCR was supported by a project grant from CRUK to Paul Pharoah. We thank Simon Gayther, Carole Pye, Patricia Harrington and Eva Wozniak for their contributions towards the UKFOCR. We'd like to acknowledge the Roswell Park Alliance Foundation for their continued support of the Gilda Radner Ovarian Family Cancer Registry. GRFOCR would like to acknowledge Lara Sucheston (Department of Cancer Prevention and Control) and Kunle Odunsi (Departments Gynecologic Oncology and Immunology). AMM, ILA, ACA drafted the initial manuscript. ACA developed the analytical methods and performed the statistical analysis. AMM, ACA, ILA, FJC, DB, SMD, DE, HN, SJR, MR, MS, ABS and BW are members of the CIMBA pathology working group and participated in the design of the study. LM and DB are the CIMBA database managers. AL wrote computer programs for the analysis. SH and OMS reviewed, recoded and classified the BRCA1 and BRCA2 mutations in CIMBA. GCT initiated and coordinated CIMBA. DFE participated in the study design and advised on the statistical analysis. RJ, TvOH, FCNi, BE, AO, IMR, MD, JG, MP, JB, PP, SM, BP, DZ, EC, BB, AV, BP, LP, LO, AS, LB, PR, UH, MV, HEJMH, JW, EBGG, MRN, MK, CS, MMATL, RBvdL, TvO, MR, DF, JLJ, DGE, FL, RE, LI, JA, RD, JC, AD, HD, HG, JE, CH, JB, LES, E McC, AM, SP, AG, RKS, KR, CE, AM, IR, NA, DN, CS, HD, DG, KK, SPA, RVM, IS, BF, WH, DS, HG, VCM, FCFC, SM, ML, NBK, AH, PB, DM, JPF, IM, PP, IC, ML, CK, ML, NS, DSL, CI, TC, MH, TH, KA,IB, CL, RBB, PS, MD, JS, MM, ST, EDA, SF, MY, TR, OO, JNW, HTL, PAG, GET, XW, ZF, VSP, NML, CS, KO, RS, MG, JB, NK, CFS, MKT, DGK, AFR, PLM, MHG, EI, FPO, HO, GG, AET, AMG, MT, TAK, UBJ, ABS, MAC, MS, KH, AvW, BA, MSA, PK, YCD, SLN, MB, PDPP, KBM, KLN, BYK, JG, EMJ, MJD, SMB, MCS, JLH, MBT, WC, AFM and DG acquired phenotypic data and DNA samples or performed SNP genotyping. All authors read and approved the final manuscript.